The recently created Sand to Snow National Monument includes a small detached section in addition to the main region between Big Morongo Canyon and the San Bernardino Mountains - an approximately rectangular area 3 by 3.5 miles in extent, containing two broad, volcanic mesas; Black Lava Butte to the west and Flat Top to the east. 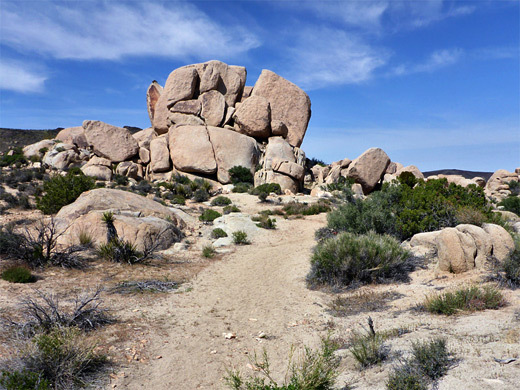 They rise 250 feet above the surrounding desert plains, along the west side of Homestead Valley, north of the town of Yucca Valley, and all the area is easily reached from paved roads along the south and east sides. 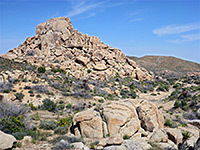 Both buttes can be climbed, and afford grand views, though the tops, and sides, are rather barren; more photogenic is the valley in between, since this is filled with a jumble of granite boulders and little ravines, and is home to a good variety of desert plants, very similar scenery to much of the nearby Joshua Tree National Park. 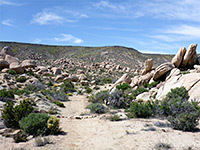 There is one maintained path between the buttes, crossing a low saddle and descending gradually to a group of bigger boulders, where it meets a vehicle track, this approximately at the edge of the most scenic area. 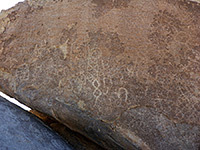 Some of the rocks beside the trail are adorned with faded petroglyphs, left by the Serrano peoples a thousand or more years ago. Sand to Snow overview map. The hike is unsignposted though does have a marked trailhead, along an unpaved residential street (Curtis Drive) starting on the north side of Pipes Valley Road, which forks west off Hwy 247. This track climbs a gently sloping hillside, passing many Joshua trees and several houses, rounds a few right angle bends and meets another track, Boulder View Drive; the trailhead is a short distance further. No Trespassing notices caution against leaving vehicles anywhere near the houses, but there are just a few potential parking places a little way back. The verges of the main road are generally soft sand though might also be suitable for parking; walking from here adds another 0.7 miles to the hike. The trail was originally also a vehicle track but is now for foot traffic only, as stated by a sign at the start, hence it is wide and straightforward to follow. The route heads due north into beautiful Mojave Desert landscape of Joshua trees, small boulders, clean, coarse sand and many flowering plants, including a few species of cacti, most abundant being hedgehog cactus and beavertail. The path rises gently to a ridgetop, on the far side of which are the first clumps of bigger boulders; the track bends to the west, back east, then has a similar, larger diversion to pass more, taller boulder piles, followed by a gentle descent as the rocks grow smaller. It runs briefly along a dry wash then up to a turnaround area at the end of a wider part of the track, a section still occasionally used by vehicles. This descends gradually over the next half mile as it curves eastwards, heading towards a rocky peak, dividing just before; the two branches loop round the hill and meet again on the far side, then beyond here a still wider track continues through generally less interesting terrain below the north edge of Flat Top for 2 miles to another residential area, bordering the east edge of the national monument. 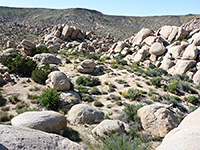 The petroglyphs seem to be concentrated along the south edge of the first-reached group of granite boulders. A fainter path heads east at the first westwards bend along the track, close to some of the best locations, which are mostly on the east side of the tallest rocks. 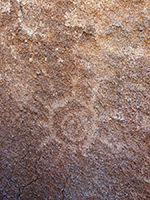 All petroglyphs are rather faded, and generally located in shady, sheltered positions, so take some time to identify. 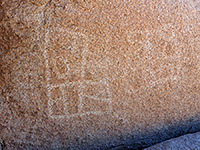 There are many other rock art panels in this section of the monument, including on the summit of Black Lava Butte.